Today is the 15th of December and 7 years since the ‘Pratyaksha’ was launched. As is our tradition, this year too the Anniversary Special Issue of the ‘Pratyaksha’ will be released on the day of Shree Datta Jayanti i.e. the 27th December 2012 to be followed by its second part on the 28th. Pratyaksha’s journey over the last 7 years has been very innovative and truly remarkable and I am sure that is how it is going to be in the years to come. Pratyaksha is not merely a news-paper that reports current events. It is an alertness and awareness paper too, a daily that will keep the Shraddhavaans ever alert in the times to come. 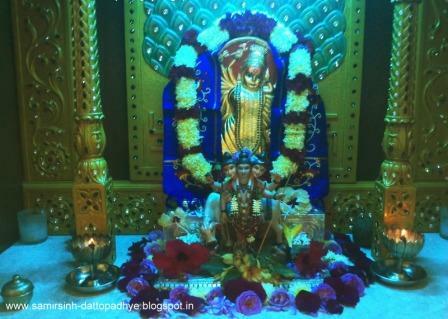 I am certain that Pratyaksha is going to prove a guide to the Shraddhavaans. Pratyaksha will be the medium that will convey Bapu’s words to His Shraddhavaan friends and so Pratyaksha will also become a support of the Shraddhavaans. The years 2001 to 2012 have seen radical changes in almost every aspect of our life and that of the world. We have been witness to them, we have been participants in them. Everything around us is changing and the aggressiveness of this sweeping change has taken charge of our life. Bapu has, time and again, spoken to us about it and even alerted us about it. In fact Bapu began talking to us about it way back in 2001, i.e. when the changes had just about begun. 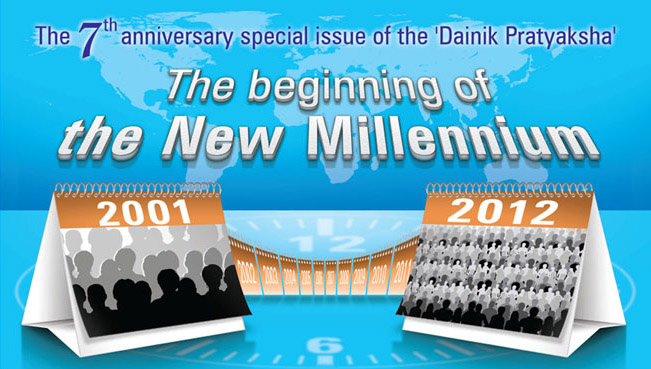 Hence this theme – “The Beginning of the New Millennium” – the theme that gauges the present situation and makes aware. two day s left for millennium bumper prize ……Here is all great the day where Dattabappa ill come n Our Bappa I'll welcome Him with divine gift…indeed a great victory…..waiting for..
love at His lotus feet….love U Bappa…. It is only the Sadguru that opens the eyes of our understanding and enables us to see things in their true light and not as they appear. Very relevant post. It seems it was few days back when the whole world was enamoured by year 2000 and lo! 12 years have passed in a jiffy. The next phase will be crucial where this 7 billion will again come down as Bappa says. Pratyaksha is much more than a news paper for all of us. It gives an opportunity to get connected to Parampujya Bapu everyday afresh. In the coming year am sure we will be seeing the e-avatar of our favorite newspaper. Seven years and now, Pratyaksha has been the eyes and ears to its readers. It is the paper of everyone’s interest, a unique paper indeed. Be it the Daily Pratyaksha or the Anniversary Special it has been a tremendous treasure of knowledge and information so much so that the articles are worth of compilation. सुरवातीला जेव्हा प्रत्यक्ष चालू झाला तेव्हा असं व्हायचं कि प्रत्यक्ष मधलं अमुक एक कात्रण करूया, त्याची पूर्ण फाईल तयार करूया. पण नंतर ते शक्यच नव्हतं कारण अफाट माहिती आणि वेगाने.It is for us to match the speed of inputs and get updated. With Best Wishes to Pratyaksha, eagerly waiting for the Anniversary Special issue !